I'm trying to start this lrp .28 spec 3 that has sat for roughly two years, I got it started and drove it around for 10-15min and it was running really rich. I turned both LSN and HSN in until they bottomed out to see where the carb adjustments where and they were both at roughly 2.5 turns out from fully closed, which seems very lean from what i understand LRP recommends 3.5 turns out on each needle for a rough starting point to tune from. The problem now is i can not get it to re start. Its getting extremely flooded and i keep making it leaner by 1/8 turns but it still floods the engine almost immediately to the point i have to take the plug out and turn it over and go threw getting the nitro out of the engine. Does anyone have a lrp .28 that can tell me where their needles are set so i have a starting point to go from. I tried the factory 3.5 turns out setting and where it was when i took it out of storage 2.25 turns out but both just flood the crap out of the engine. Glow plugs are new, glow plug ignitor is fully charged and i am using the "rotary start" I'm unsure of the actually name but it uses a 7.4v battery and no pull start. Im wondering if i am over looking something that could cause it to dump so much fuel into the motor, usually a air leak or something of that nature would cause it to run lean, correct? Set the high speed to 3.5-4 turns open from lightly seated. Set the low speed so the screw head is flush with the edge of the throttle arm, then turn it in 1/2-3/4 turn. Set the idle gap to 0.5-0.6mm. The idle gap is probably the most important setting. Too wide of an idle gap coupled with an over-rich idle mixture will lead to flooding pretty easily. Fill fuel tank, prime engine using the pressure line from the muffler to the tank. Blow into the pressure line and watch the fuel go to the carb. Stop blowing a moment after fuel reaches the carb. Light the glow plug and hit the starter. It should fire right up and be rich. Work the low speed leaner just until it will hold a smooth low idle, then set the high speed needle, and return to the idle needle to get the idle and midrange set. You may need to hold the throttle open 20-30% to get it to start if it’s a little too fat to idle on its own. Use a medium heat glow plug like an MC8 McCoy. I will try everything you said tomorrow afternoon, but im pretty sure as of right now my settings are leaner then what you are recommending, which is where i become puzzled with this problem. Im not a complete newbie to nitro but obviously i am no expert. Again ill check my settings tonight and report back, and again tomorrow afternoon when i get to try to start it. I really appreciate the quick response, i always get this part mixed up and when reading about it some write ups say it one way and others the complete opposite. Should i try to tune the LSN first or the HSN first? Also does the HSN setting have anything to do with the A/F mixture of the engine at idle? The high speed needle controls overall fuel flow to the engine, but more importantly it basically is the sole fuel metering circuit once above about 1/2 throttle. If the high speed is way way too lean, it will make the idle needle ineffective, but that’s pretty rare. Most short needle carbs - which I believe the RTR type LRP engines have - require the high speed to be set first (because its in a fixed seat) and then the low speed after. The only reason I suggested rough setting the idle needle is only to keep it idling on its own. If the idle gap is too wide and the idle mixture is too rich, it will basically slowly flood the crankcase with fuel and once you pop the throttle, it will douse the plug and you’ll have a flameout. Restarting will be futile because the plug will get drenched again if not already and you’re stuck pulling the plug, draining fuel, and cleaning the plug off. With problem engines - or engines with out of whack settings - ensure you have a good or NEW aglow plug installed as well as a FULLY charged glow driver. You want that plug burning blaze orange. 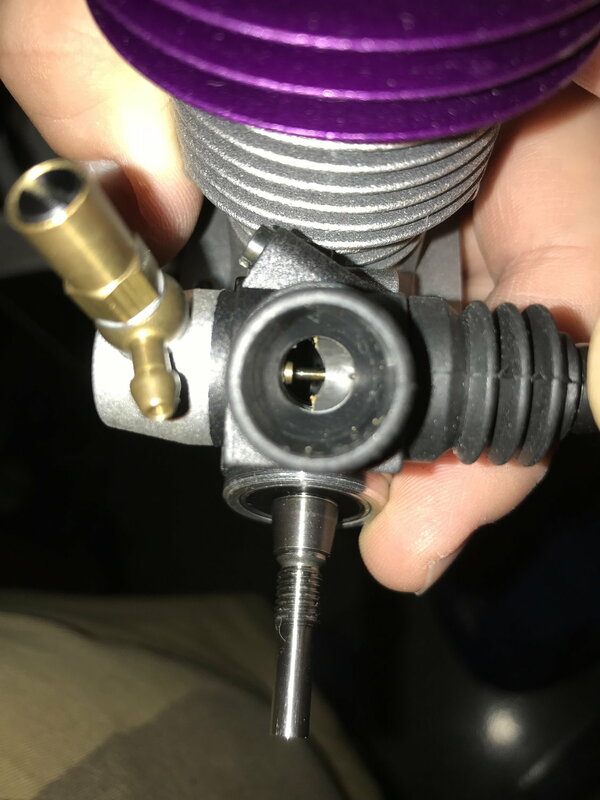 I followed what you said and have the HSN to 3.5 turns and the LSN is at 1.5 from closed, this was based on making the screw flush with its surround metal and then going in .5 turns and the idle gap is set to a touch over .5mm. I will try to start it tomorrow afternoon and report back. so if your recommendations are close that means i originally had the HSN very lean and the LSN very rich... what's even scarier is the last person who tuned it was an "expert"
EDIT: yea i when i would pull the plug it was doused in fuel and when turning the truck over and spinning the engine it would almost leave a puddle, i've never seen a motor this flooded. and like you said as soon as i touched the throttle it would die and sometimes when taking the ignitor off it would stall aka flame-out i believe. Last edited by Lt4-396; 04-11-2018 at 07:07 PM. mixture is too rich. Usually the latter. It’s easy to get an engine to run reasonably well with a needle compensation situation - ie: rich low and lean high. This is where the idle gaps start getting wide “because it won’t idle otherwise”. When you have your carburetor properly set, you will know by the sound of the engine. When you’re “on”, the top end should just howl and the low should give a low lopey idle. It probably will sound like it’s gonna die, but it shouldn’t. Way to check your low speed mixture: run a couple WOT passes and note the exhaust note with the engine at idle. Within 5-7 seconds, the rpm should drop to that nice and slow idle. After about 10 seconds, hit the throttle to WOT; the engine should pickup and clean out virtually instantly. Maybe a slightly heavier smoke trail/cloud at first. Letting it idle for 15-20 seconds and it should burble a little bit, but not flame out. Basically you want it to ever so slightly load up - very slowly. The engine temp should drop 1-2 degrees for every couple seconds of just idling. Another key to getting a good tune is having the proper fuel. For bashing, I run 20% Nitro with 11-12% oil (castor/synth blend). Fuel with too much oil will be more difficult to tune to and also will run hotter. Don’t use “RTR” type fuels. when you say idle mixture do you mean the idle gap or the LSN? I tried starting it at your rec. settings and it was close enough to almost start and i leaned it out a touch more and sure enough it fired right up. Its still running way to rich, i only had about 30min all together so i leaned the HSN about 1/4 turn and the LSN about 1/3 of a turn and its running strong but still too rich. Im going to keep tuning and leaning it out an hour at a time tomorrow morning. I really appreciate your help, idk where lrp gets off saying the LSN should be 3.5 from closed... if it wasn't for you and this forum i would be trying to start a ridiculously rich engine that obviously would not have started. How fast should the temp reach the 200's, when its say 60 outside? Mixture setting changes are made with a needle valve. So idle mix = idle needle valve. High speed needle = main needle valve. Idle gap is idle gap. New engines tolerate those mega rich conditions much better than a broken in engine. Those “factory settings” are a general starting point where that engine in new condition is guaranteed to start and run. The break-in settings are often very different (leaner). You should NOT fine tune your carburetor until you’re done with a complete full tank of fuel at reasonably close setting to ensure the engine heatsoaks completely. Last edited by 1QwkSport2.5r; 04-12-2018 at 02:10 PM. The LRP Z.28r is a short needle engine, so the LSN should be tuned just for a nice idle. It is the HSN needle, that controls low, mid and high throttle settings. Any of the experienced Guys around? Do you agree with this statement please? The idle needle controls idle and the midrange up to about 50% throttle approximately. You can tell your idle is still too rich if you drive the truck around at 50% throttle and it starts to burble and sputter; and then burp a bunch more when you open the throttle further (it might quit if you punch it hard and fast while loaded up). Short needle carbs should have the idle tuned so you have a nice slow idle with an ever so slight loading up while having a clean running midrange. AFAIK - the only real difference between long and short needle carbs is how much influence the idle needle has and for how much of the throttles travel. Short needle - idle to 1/2 throttle or so; long needle - idle to 3/4+ throttle and the main needle covering overall fuel metering as well as WOT fuel metering. First off: Thank you very much for your response and info. I really appreciate it. I have nothing to prove, I am learning. Having said that, I have owned and tuned (to my best know-how) REDS, Werks and LRPs. I am only mentioning engine carbs with short LSN needles that came in my house. (You can see the difference, as you know I am sure, by looking down the neck of the carb. A shorty is out if the barrel at approx. half to 3/4 throttle. Long LSN needles (Picco. Nova, Triton etc.) will still stay in the barrel orifice at full throttle (different bag of bags!). I was told and (honestly am all the time) by the old farts in my local (EU) track to ONLY tune a short LSN needle for idle, NOTHING ELSE. Basically, fire a run-in engine up with a pre-set 0.5mm idle gap, (warm it up to running temps. etc. etc. ), make sure your idle can keep loading for 20-30 seconds, then tune the HSN to where I want it, by constantly re-setting the LSN for just keeping a crisp idle. EasyPeasy. I must say it works for me. My LRP ZR .30X and my Werks B5 II has been running perfectly with this method. But I am ready for more experience. Please explain how a short LSN carb can tune 0-50 % acceleration with the LSN. Gents and Gals, my apologies to Lt4-396 who started the thread and to all the mods: I never meant to hijack his thread. Sorry. Last edited by Luxer; 05-28-2018 at 01:02 PM. I have Novas and Piccos, as well as several SH based engines. Every big block engine I have ever owned have been short needle carb equipped engines. Until the idle needle is completely out of the orifice, it will interfere with fuel mixture. I’ve never owned a long needle carb equipped engine, so I cannot say for sure. But what I can tell you - rotary carb or slide carb; the idle needle will have some influence over the midrange. Depending on the design of the carb, some have more influence than others. The most common tuning problems I hear people trying to sort out are too large an idle gap and getting their compensation tuning fixed. By this I mean lean idle and rich top end and vice versa. This problem only gets magnified when the idle gap is huge. My tuning method is simple. Break the engine in on more oily fuels initially. Preheat the engine!!!! I will preheat an engine if it still has a cold pinch. The longer the pinch stays the longer the engine will last. Idle gap starts at 0.5mm - never bigger than .7mm. Run one tank of fuel to heatsoak the engine. Once this is done, do your final tune. I have been running nitro engines for 20 years. I currently own 58 Engines, and every single one of them gets tuned the same way. High first, low second, note transition. Engines with midrange adjustments do get used. Do you ever do a fuel line pinch test on the box (initially) to check the LSN needle? Do you trust this kind of check? The pinch test isn’t accurate on truck engines IMO. I do not use it. I set it by ear and engine behavior. Attached is a photo of one of my Novarossi’s with a short idle needle and showing the needles position at 1/2 throttle. The idle needle probably has influence above 1/2 throttle.